"America is a nation of immigrants, built by immigrants and we need to honor that heritage by fixing our broken immigration system, while upholding the rule of law and championing legal immigration," said Senator Ted Cruz (R-TX) in a statement last week when offering an amendment to the Schumer-Rubio immigration bill. Cruz, the son of a legal Cuban immigrant, is absolutely correct. Immigration is the foundation of this great nation. Millions of immigrants from all over the world have flocked here to better their lives. Anyone who comes here and becomes American can make it if they work hard and realize their full potential. That is why legal immigration must be encouraged. Sadly, lawmakers are more interested in trading our sovereignty for votes and political favors a la amnesty. The “Gang of Eight”--which comprises four Democrat senators and four Republican senators--is attempting to ram through a 867-page bill in the fashion Obamacare was ushered in. They decry that if we do not go along with this deal, we are perpetuating “de facto” amnesty. 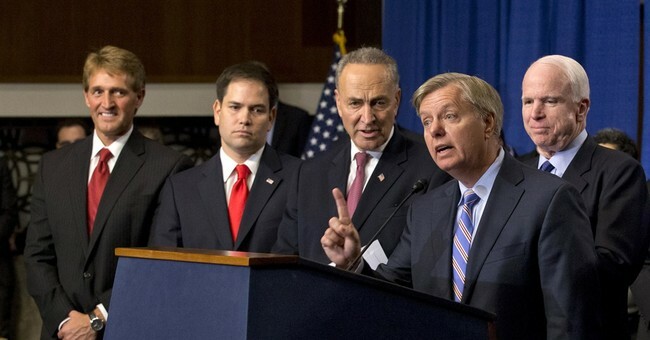 Like the good politicians they are, the Gang of Eight assures us their plan will fix our border problems. Clearly that is not the case. Heritage Foundation recently released a report detailing the costs of the “Gang of Eight” immigration plan. The report estimates the plan will cost American taxpayers a whopping $6.3 trillion over the next 50 years. If this bill were to pass, amnesty would be implemented in several phases. In the first phase, illegal aliens would receive legal status but not have access to means-tested welfare and Obamacare. After 13 years, the second phase would allow them to access means-tested welfare and Obamacare. The final phase of amnesty, or retirement, would grant them access to Social Security and Medicare. Not surprisingly, many leftists and pro-amnesty Republicans immediately attacked Heritage Foundation’s report besmirching the think tank for being “racist” and a “scaremonger.” Instead, outrage should be placed on the Gang of Eight’s plan since it is slated to waste money, grow the welfare state, and undermine border security. The question beckons: why are lawmakers circumventing legal immigration? Approximately 4,412,693 people are waiting to become American citizens. Inefficiency, endless red tape, and continual pandering to illegal aliens have left this important contingent in the dark. For example, a friend of mine from New Zealand recently became a U.S. citizen after waiting 14 years. He followed laws, assimilated, and patiently waited for citizenship. Countless other applicants for citizenship wait decades to be granted citizenship, as well. It is important to note opposing amnesty does not make one “anti-immigrant” or “racist.” Supporting legal immigration coupled with the rule of law is in America’s best interests. As a daughter of immigrants, I can personally attest how great legal immigration is. My parents legally came to this country 27 years ago as political refugees from the formerly Soviet-occupied Baltic Republic of Lithuania. My mother and my father were extremely lucky to receive exit visas. After five years of waiting, they got green cards. Several years after that, they were granted citizenship. Today, my parents remain grateful to be naturalized Americans. Like the millions of legal immigrants who came here, my parents sought freedom and opportunities that were denied to them in the Old Country. They learned English and assimilated. They didn’t ask this government for handouts nor did they bypass the law to acquire citizenship. They followed the rules and are extremely grateful to have been bestowed with American citizenship. Legal immigrants like my parents respect the rule of law, desire to become American, and do not demand government handouts. They see citizenship as a privilege bestowed to them--something they must pursue and work hard for. When citizenship is freely handed out like candy, people do not value or appreciate this country. Citizenship must be earned. Becoming American should be celebrated and encouraged. Millions of people from Europe, the Middle East, Asia, South America, and Africa have traversed this great nation and added to her greatness. They retain their respective cultures and value systems but adopt the American way of life. America is and must remain a melting pot. Improving and reforming legal immigration, not granting amnesty, is the only way forward. If individuals desire to become American, they must do it the right way--the legal way.